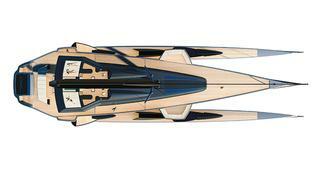 The UltraLuxum CXL160 trimaran’s design now features retractable beams. In the open sea, the Ultraluxum CXL160′s outer beams extended out to make it 23m wide. While in harbour they retract, making the boat’s breadth just 11m. 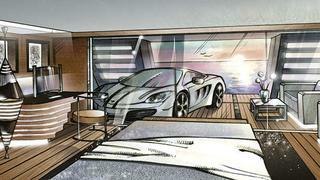 Ultraluxum CXL160′s owner’s cabin includes space for a car. 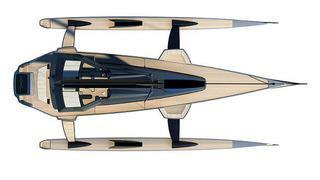 The genesis of the UltraLuxum CXL160 trimaran – involving a prince, a flying boat and a watchmaker – has something of the fairytale about it. But Jean-Francois Ruchonnet, founding partner of the UltraLuxum Group and a former chief of horology at Chopard, has worked to make the design a viable reality. Indeed, after 27 years of creating fine watches, fifth-generation watchmaker Ruchonnet left to design his multi-hull. His chutzpah received a royal seal of approval. The concept – still at the design stage and awaiting a client – connects the luxury yachting scene so vital to the culture of Monaco and the exhilarating sailing that inspired Ruchonnet on Lake Geneva. The composite sloop-rigged trimaran will feature a 55m mast with about 1,200 square metres of sail area, and is estimated to reach 25 knots under sail. It will have a master cabin and either four guest cabins, or three guest cabins and a spa. A contemporary interior scheme was penned by naval architect and designer Jean-Jacques Coste, with the support of UltraLuxum’s Jessica Sbaraglia. 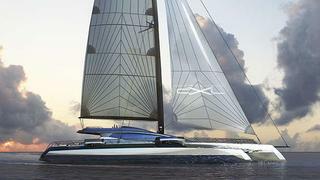 If built, it will be the largest cruising trimaran in the world. But the design’s most exciting feature is its folding hull beams, which reduce the boat’s width from 23m, in sailing configuration, to 11m in harbour configuration. These enable stability at sea and make access to crowded marinas easier. Ruchonnet invited multihull specialist Coste to be his partner and he has been invaluable in giving the concept a solid technical foundation. This is not the only development since we first reported the UltraLuxum on our website last year. The flybridge has been widened, the mast bulkhead moved back a metre to increase space, and the floors lowered to improve headroom and visibility. The design has also blossomed into a range of four, comprising a CXL130 (39.6m), a CXL100 (30.4m) and a super-light CXL80SL (24.3m), as well as the 48m, which can also now carry a car. For all these models, only sustainable wood approved by Prince Albert’s Wood Forever programme will be used in veneers, teak decking and so on. There is also an emphasis on environmentally friendly power. The modern, innovative attitudes of the designers have led to interest being expressed through the UltraLuxum’s broker Bluewater. So, like one of Ruchonnet’s cleverly designed watches, it looks as though this yacht just might make the transition from dream to reality.